Hi, guys. My name is Darrel and I'm head of the tech team here at LocksOnline.co.uk. Thanks for taking some time to tune in and have a look at one of our product review videos. The product that we've got here at this moment in time is the Asec Sash Jammers. Now these products on our website. They sell by the bucket load to be honest with you. What we thought we'd do we put a video together for people who might not really understand what it's all about and how they work to try to get you some sort of better insight in how they fit in windows and actually doors as well. The idea is quite simple. This is the actual product here is that you would screw this onto the frame or it can be on the door. It depends on what type of application you've got. If the door opens outwards, then you would be putting this on the door. If the door opens inwards, okay, then you would be putting this on the frame. Most doors and windows in the UPVC sector when you actually close them, you find that there's a raised position between the two and what you'll see is that the actual side here is different to that actual part there and therefore this allows you to have that gap, that space between the two. When you're looking at your window, it'll become self-apparent between the frame and the actual window itself, or the frame and the door itself that there's a step there and that step could be something of around about maybe 10 mm depending on your make and model of door. So what Asec have done is they've come up with a range of little caps and these little caps are different thicknesses and what the idea of these little thicknesses are is that you can pack those out depending on what step the size of the step that you have. Now for whatever reason Asec has decided not to pack screws with these particular locks and I kind of guess is because it depends on what you're trying to affix them to in respect to whether you've got metal on the inside or whether or not you're just screwing into the plastic itself. Ideally what you would do and what we recommend is drill a small pilot hole and see how far the steel is inside the frame of the door or the frame and try to get a self-tapping screw that's long enough to actually get into that steel and therefore you know then your security is sound. They come in little packets here as you can see here. Once you've actually fitted your screws into there, these little covers then sit on there like that and there you go and then makes up for a nice tidy finish. The idea is then that you simply move these around like that depending on whether or not you want to lock, you put in that position. That locks the doors, stops it from opening. If you put it to there, then obviously it doesn't. 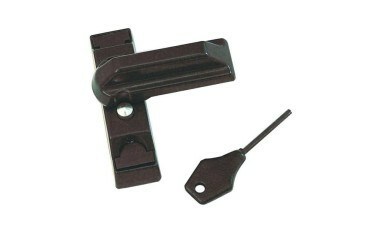 There is a range of locking versions as well on our website which allows you to actually lock it in that position. This particular model is unlockable. They're very handy for providing that little bit of extra security like a shoot bolt at night. Here, we used to having on a wooden door. You can now turn around and pop these, put one at the top one at the bottom and just turn them up there to give yourself a bit more security. There you go, guys. That's the white version. It's the Asec Sash Jammer. It's available at LocksOnline.co.uk and what I'll do quickly is I'll get some measurements for you just to give you some sort of idea what the footprint is. The actual footprint there is 70 mm. Its width there is just a smidgen over 20 mm, 21 mm. The fixing centre is there if you want to know what those are, it's 42 mm, and when you actually push that out there like that, that distance there is 40 mm, okay. These packers as I said before will change this depth here but as it stands when I post packers that there is 20 mm, okay. So the maximum thickness of the one here is let me get that quickly. That's 5 mm. That's going to drop it down to 15 mm. So there you go, guys. If you need any more information or advice or you need a little bit more help on these, by all means, pop on, use our email, use our live chat, give us a call, and we'd love to hear from you. More importantly, we'd love to see you as a customer. So from me, Darrel, and all of us here at the LocksOnline team, thanks for tuning in and catch up with you real soon. Take care now. Bye.